When going out hunting, you need to be sure that your hunting gear matches your hunting needs. At participating in medium distance engagements, then a variable low-power magnification scope with a daylight visible illuminated dot should be at the top of your list. Now I know what you are thinking. This type of scope seems expensive and out of your reach. Not any more! 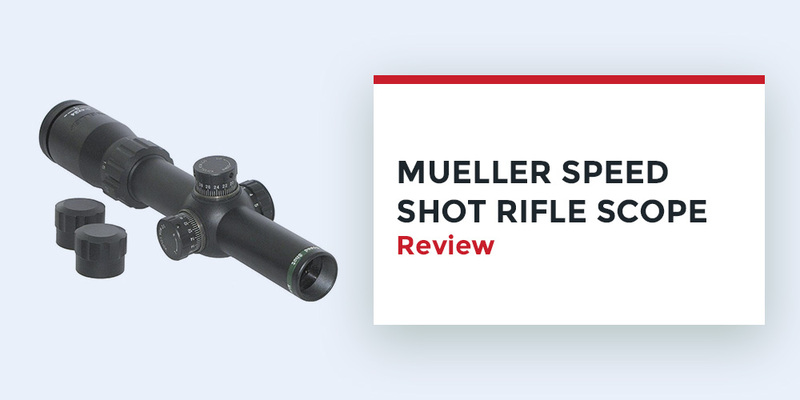 Mueller has created the Speed Shot riflescope, which manages to meet all of the aforementioned specifications without burning a hole in your pocket. This riflescope excels in all areas, starting with construction and ending with versatility of features. It is for these reasons that the Mueller Speed Shot has become a popular tool for bear hunting, turkey hunting, hog hunting, close range varmint hunting, and close quarters tactical maneuvers. So purchase to a Mueller marvel for your next hunting expedition, check out the review below. The most prominent feature of the Mueller Speed Shot is its illumination system, which consists of a bright center dot that can be viewed on the sunniest of days. This illumination means that you can see the reticle in daylight conditions without suffering from the effects of tube glow. The bright 4 MOA dot reticle on the scope operates with and without illumination, so that you can use the scope without worrying that the battery will run out mid hunt. Furthermore, the illuminated reticle covers 4 inches of target at 100 yards, and has 11 dot brightness settings which promote versatility. One of the worst things that can happen while out hunting is damaging your equipment. That is why Mueller has taken great care to construct the Speed Shot scope with rugged and durable materials, so that it is fully waterproof, shockproof, and fogproof. This dependable construction will therefore give you peace as mind as you hunt. Furthermore, the 30mm matte tube of the Speed Shot gives you the ability to fit an assortment of riflescope rings, for added convenience. One of the most lauded features of the Speed Shot is its clear and sharp optics. These great optics come courtesy of the generous 24mm objective lens. These fully multi-coated lenses promote clarity, so that you have exceptional views of your target when you are outdoors. Additionally, the wide objective lens of this scope allows for a wide field of view, so that you can have a clearer picture of your surroundings as you hunt. 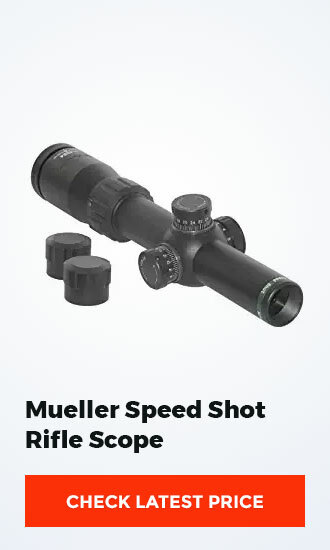 The Speed Shot is without a doubt one of Mueller’s fastest target acquisition rifle scopes. This variable scope has a fast-focus eye piece, which gives you the opportunity to quickly line up your targets so that you waste no time taking shots. This high resolution and high speed Mueller scope is therefore perfect for dealing with evasive targets. What is the point of having a riflescope if it inaccurate? Luckily for you, you do not have to worry about that when you have the Speed Shot. This riflescope is equipped with 1/2 MOA elevation and windage turrets, which can be adjusted with an audible click. This allows for excellent accuracy at all heights, and in all conditions. Q: Is the IR-visible in daylight? A: The firm brightness dial has setting ranging from off to 11, and this makes the etched red dot reticle visible even in bright daylight. However, the best thing about the Speed Shot riflescope is the fact that its has a black dot reticle, which allows you to see your target even when the battery is off. Q: What can you tell me about the capped turrets on the Mueller Speed Shot scope? A: Here are the details on the turrets; there are no exposed turrets, instead you have large target-style finger adjustable turrets. Unfortunately, the turrets on the Speed Shot are not resettable to zero. This riflescope well-illuminated, exceptionally accurate, and fast-targeting riflescope for close and long range engagement, then the Mueller Speed Shot should be high on your list. This feature-rich scope has all you need, at a price that is unrivaled.